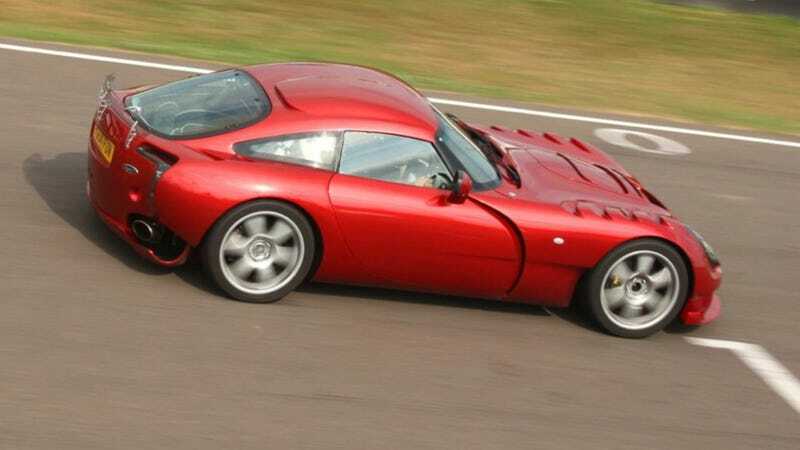 We Jalops have been cautiously optimistic about the revival of famed British insanemobile TVR so far. Now, an interview with the company's new owner has given us even more reason to be optimistic. Can he really get it right and bring TVR back from the brink? In an interview with PistonHeads, TVR's new owner Les Edgar elaborates on his gearhead street cred, his plans for the company, and how he aims to repeat the kind of success that Land Rover has seen as of late. The story says that Edgar made his fortune as a computer game developer and now "runs a country house estate," which, to my uncultured American brain, makes it sound like he rolls like Lord Grantham. He's also backed Aston Martin's re-entry into Le Mans in 2002. Why? Just because he wanted to, that's why. He also says he's owned TVRs in the past, but declined to elaborate on which ones, for fear of misleading the public on what kinds of cars they might produce now. That goes to the spirit of the rest of the interview, which is moving the company forward while maintaining the "DNA" that made it what it is. PH: Some horrible things have happened to the brand over the last 10 years. Is that a problem, or can you reset the button to 2004? Edgar: “I wouldn’t dream of doing that. I’d like reset the button to 2013. We are what we are. We’ll be judged by the steps we take. I can’t do anything about what happened in the interim. All I can do is move forward, put my money where my mouth is and be judged on the results of that. This not about going back, this is about going forward. PH: But you couldn’t even build those cars again, even if you wanted to, right? Edgar: “Why couldn’t we build them again? Of course we could. We own everything to do with the cars, we bought everything lock stock and barrel. We can build what we want to build really. The point is not that. The point is we wouldn’t want to relaunch those cars. We’re not building a company on nostalgia. We’re building on what people want to buy. And we understand what people probably want to buy has got a lot to do with the DNA and what they could buy before. Due to the deal with former owner and Russian businessman Nikolai Smolensky, Edgar declines to elaborate on some of the details of production, including whether they will be building their own engines, whether they have a partnership with another company, or whether they got the "jigs and molds" from previous TVRs. But to Edgar's credit, he does sound like the right person to run this company. One thing he will confirm: "We’re clearly not going to be building wind turbines." And thank God for that. Let's hope this works out. Britain, and the rest of the world, deserves a TVR comeback. Check out the rest of the interview and let us know what you think.